fictional setting in which they’ll be writing. Since I’ve been doing a lot of this myself lately (not about dragons but other things), it’s much on my mind. So… You want dragons. Despite the occasional reaction against dragons as overused – I have heard writers bragging that their Fantasy fiction is a “dragon-free zone” – I completely understand the impulse. 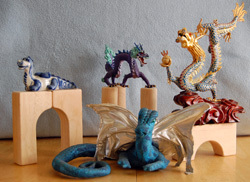 I’ve been visited by dragons in a few of my pieces. 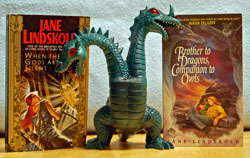 Of course, they were rather strange dragons… One was two-headed and rubber (Betwixt and Between from Brother to Dragons, Companion to Owls). Another was more an elemental spirit of treacherous nature than a fire breathing lizard(the eponymous creature in The Dragon of Despair). Then there were the Chinese dragons featured in the “Breaking the Wall” novels. The fact that dragons are extinct is a major point in the athanor novels, Changer and Legends Walking. That raises the first question. What sort of dragon do you want? Do you want something modeled on the classic European dragon? If you want this sort of dragon, do you want the simplest form – fire-breathing, violent, and destructive – or do you want the more refined model, still fire-breathing, still capable of violence, but also sophisticated, interested in riddle games and maybe even rulership? Or are you looking for something closer to the Chinese dragon – or lung – a very different beast entirely? If you do your research, you’ll find that there are several varieties of Chinese dragon, each associated with different landscapes, each with its own tastes and quirks. Which of these do you want? Let’s say you want something closer to the European dragon. Inspired by Smaug from The Hobbit (or perhaps the myths and legends that gave him birth), you want the more sophisticated model. You’ve decided that you’d like a male. He’ll have scales of a burnished red, highlighted with copper. He flies, eats meat, hoards treasure, and demands the occasional virgin maiden. Actually, not quite… A dragon of this sort is a peak predator – that is to say, at the top of the food chain. 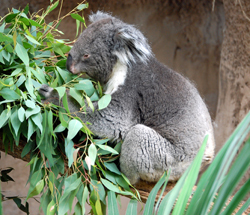 Even if he eats only occasionally (even lesser peak predators like wolves and great cats eat only a couple times a week), when he does, he eats a lot. Where is he getting this food? How do the locals feel about having their flocks – or game preserves – raided? Well, sure, if you want your novel to have the depth and lasting power of this year’s current hot computer game, that’s enough. Kill the dragon and level-up. There’s satisfaction in that. I’ve done it and felt it. But we’re talking about writing a story here, maybe even one that will have some staying power in the reader’s imagination when “World of the Wyrm” is forgotten by all but die-hard gamers. Let’s look at Smaug… Smaug’s treasure was what brought the dwarves (and Bilbo) to him, in some cases for wealth, but in some cases because they knew things of great power were hidden there. Smaug didn’t come out very often, but when he did the people of Laketown suffered. That meant they were both willing to fight against Smaug and – in the latter part of the story – felt they had a right to some of the loot, enough of a right that they were willing to go to war to secure their share. Their neighbors also had a long relationship with Smaug. Even those who had not been victims of the dragon’s greed and rapine knew about the treasure – and wanted it. These same questions underlie the action in a SF treatment of dragons. In Dragonflight, the first book of Anne McCaffery’s Pern novel, the locals are getting tired of supporting the “useless” dragons in the Weyrs. They also don’t think much of what they see as essentially sacrificing a virgin or two. By underpinning her science fictional concept with these mythic resonances, McCaffery gives her piece depth. Her twist that the big, fire-breathing, peak predator (who do, in fact, have a “taste” for virgins) are ultimately not monsters but saviors reshaped the concept of the dragon in both science fiction and fantasy. Dealing with Dragons by Patricia Wrede provides a creative answer to the question of why dragons demand human princesses. I don’t want to offer a spoiler so I’ll settle for saying that this book – and its sequels – don’t just provide a twist. They use the twist as a fascinating foundation for a new setting. Teeth and Claw by Jo Walton is another novel that takes the politics of intelligent dragons to a new level. Initially, the dragons could be humans with, well, teeth and claws. Then, just as the reader gets comfortable with this, Walton shows you that her characters are not human at all. Then the book becomes truly draconic. So, why think about your dragons? Your pegasi? Your unicorns? Isn’t it a lot of work for nothing? (I mean, everyone knows what a dragon is.) I hope the examples above give you an idea why you might bother and why bothering not only makes for a better story, it also can be creatively stimulating and (dare I say it?) just plain fun! Oh! And Happy Leap Day to you all! If you’re looking for the Wednesday Wanderings, just page back and sing along on “Getting to Know It…” Then come back and join me and Alan as we continue to explore Terry Pratchett’s version of Australia. desserts after opera divas. What’s that all about? ALAN: Well, everyone has heard of Peach Melba, of course. That’s named after Dame Nellie Melba who was a famous nineteenth century Australian soprano. But the quintessential Antipodean dessert is named after a ballet dancer rather than an opera singer. The pavlova is a meringue with a crispy crust and a soft, marshmellowy interior. It is topped off with whipped cream and fresh fruit. The folklore says that it was created to honour the Russian ballerina Anna Pavlova when she toured Australia and New Zealand in the 1920s. Since she toured both countries, both countries claim to have invented it, which leads to endless arguments of course. New Zealanders get quite passionate about claiming the pavlova for their own. The Australians are rather more laid back about it and Robin claims that few people are even aware that the argument exists at all. In 1999, Te Papa, the National Museum of New Zealand, baked a 45 metre long pavlova to celebrate its first birthday. It was known as “Pavzilla” and was much admired. In 2005 some students from Hawkes Bay in the east of the North Island baked a pavlova called “Pavkong” which was 64 metres long. So even if the Australians did invent it, we’ve definitely got the world record. So there! JANE: Since, once again, we’ve managed to get onto the subject of food, what about the meat pie floater? As Pratchett describes it, this is a mushy pea soup with a meat pie in it, sometimes topped with tomato sauce. I’m hoping you’ll tell me Pratchett made this one up – especially the tomato sauce. The pie floater is traditionally purchased from pie carts in the small hours of the morning after an evening of hard celebration. Apparently it is good for hangovers, though opinions differ as to whether it cures them or causes them. JANE: If a meat pie floater – especially with mint sauce – is a cure for a hangover, I’ve just come up with another reason not to take up drinking! Just one more question… Rincewind invents a hat with corks hanging from the brim to knock out the flies before they can get to his face. Do – or did – such hats ever exist? ALAN: Yes. And no. It’s a stereotype of course, but nevertheless the fly infested Australian outback certainly demands something to keep the insects at bay. It seems probable that the cork hats or something similar did exist at one time. But if they did, they’ve long since fallen out of favour and the only place you see them now is in souvenir shops where they sell in their millions to the tourists. JANE: I can just see a sozzled tourist talking through the side of his (or her) mouth and wearing a cork hat through Customs. I’m beginning to appreciate just how much research Pratchett put into The Last Continent. But I’m still certain I can catch him out over-exaggerating! Just wait ‘til next time! You’re writing a story. The characters are “live” and the plot is singing, but you realize that something’s wrong, something’s flat. After consideration, you realize that it’s the setting. It’s not enough. Where do you start? “Write about what you know” is a basic principle in most fiction writing courses. It’s also one that most beginning SF/F writers rebel against. I want to write about dragons! I want to write about wizards! Those don’t exist except in fiction, so how can I “know”? Can’t I just make it up? Sure. But what are you going to make it up from? I hate to tell you this, but writing speculative fiction (an umbrella term that embraces science fiction, fantasy, horror, and their various offspring) isn’t an excuse to do less research, it’s a requirement to do more. Not if you don’t want your readers to snarl at you. The “Twilight” novels have been very successful, but this hasn’t kept lots of nasty comments being made about Stephanie Meyers’ unfamiliarity with the basics of folklore regarding vampires and werewolves. She has lots of readers, true, but she’d probably have even more if she hadn’t shut out a large potential readership – and certainly she’d have spared herself a lot of grief. Yes. You can. I’ll leave it to others to list the derivative authors who have been very successful but, based upon what I saw in the comments last week, maintaining “voice” is very important to most writers. How can you have a voice if you’re just copying someone else? Great! You’ll be in good company. J.R.R. Tolkien did a lot of background work for his “Middle Earth.” You can find some of it in The Annals of Kings and Rulers and other appendixes to The Return of the King. The Silmarillion is considered unreadable by many, but that’s because it’s not really a novel. My husband Jim (who is both a huge Tolkien fan and an anthropologist) said he suddenly understood the The Simarillion when he realized it was actually an origin story – an explanation for where everyone came from and of the roots of the current conflict – not a novel. I believe that one of the reasons that Tolkien’s novels continue to garner new readers is because he was indeed writing about what he knew. He knew where his elves came from and his dwarves. He knew why various dragons lived in various places. He knew why there were balrogs. His novel might have been fantasy, but he had worked out the foundations of his world. Simple? Hah! Questions of inheritance – especially when what is being inherited is a throne – are never simple. Look at the conflicts following the death of Henry the VIII if you want a great example. Or watch the play (or marvelous film) The Lion in Winter (which is about King Henry II). Liberties were taken with the history, but it’s a great demonstration of what happens when there are multiple potential heirs, each with strong claims. But Through Wolf’s Eyes isn’t set in historical England. It’s set in a fictional world. Therefore, first I had to ask myself who was eligible inherit: The first born? Any child of the monarch? The favorite? The sister’s son? (In some cultures, inheritance passes through the female line, even when females themselves aren’t eligible.) Are females included? I decided that, in Hawk Haven, in usual cases inheritance would pass to the first born, females included, moving down the line in case of death. However, in Through Wolf’s Eyes, King Tedric’s first born is dead. His second born is also dead (but her husband is around and some feel he has a claim). His third born is missing – and also disinherited. This would then move the possibilities sideways – to King Tedric’s siblings and, because his siblings are fairly elderly, to their children. I’m going to stop summarizing here. Suffice to say, before I could move into writing this stage of the novel, I had to design for myself the equivalent of a treatise on inheritance law in the Kingdom of Hawk Haven. I also had to write a complete family tree for King Tedric’s family, going back several generations and forward to infant children. To do this, I needed to make biographical sketches of most of the people involved, explaining who they had married or why they had not married and if they had children. It took quite a bit of effort and a lot of going back and forth. However, when I was done, I had a solid foundation for the intrigues that underlay the action of the book. Now I was writing about what I knew. Much of what I knew didn’t make it on the page, anymore than Tolkien introduced the history of Morgath (who was responsible for the balrog) into The Fellowship of the Ring, but I knew. I’m going to stop here and invite questions and comments. However, this topic is much on my mind, so I might very well return at some future date! If you’re looking for the Wednesday Wandering, just page back and join the chat about when and where two (or more) heads are useful in the creative process. Then come back and join Alan and me as we venture more deeply into the Last Continent. 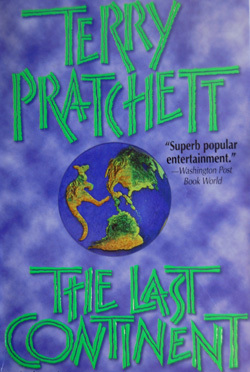 Rincewind is accused of stealing a sheep, he is astonished to find that everyone wants to turn him into a folk hero. As one fellow puts it, “all our big heroes have been sheep-stealers.” Just how firmly is this concept rooted in Australian history and culture? Have criminals become heroes? Given what little I know about Australian history, this must be quite a change. ALAN: I think the romantic outlaw is part of the folklore heritage of every country. Robin Hood in England, Jesse James in America, Ned Kelly in Australia. Perhaps there’s a grain of truth in all of them, and maybe Australia takes the myth further than some other countries do. These days, that’s not an uncommon attitude. There was a time when Australians were a little bit ashamed of their history as a penal colony. Robin’s mother would be quite horrified if she found she was descended from convicts (fortunately she isn’t – Robin’s been digging deep into the family history). Robin distinctly remembers this change in attitude happening in her lifetime. It seems likely that it is a side effect of the general liberalisation and tolerance that was part of the lifestyle of the 1960s peace and love generation. Certainly the baby boomers are very proud of their penal past and now that feeling is quite firmly entrenched. JANE: Thanks, Alan. It’s interesting to know when that transition in attitude happened. An archeological article I read recently talked about how many of the early buildings had been destroyed because of their ties to the penal colony past. ALAN: That’s true – though ironically the very first building the convicts built in Fremantle in Western Australia was their own prison, a grim building which remained in continuous use until 1991. These days it’s a tourist attraction. When the prison was refurbished prior to opening it to the public, it was discovered that one of the prisoners had spent his evenings drawing beautiful pictures on the walls of his cell. Since this was against the rules, every morning he would gaze his fill on his work and then camouflage his work by smearing his breakfast porridge over the pictures. The next night he would decorate another section of wall. His pictures remained hidden for almost a century, which says much about the quality of the porridge, not to mention the efficiency of the cell inspections. JANE: Moving back to Pratchett: Was there really a bush ranger called Tinhead Ned? ALAN: Tinhead Ned is a made up character, but he’s definitely an amalgam of the kind of people that populate these legends. The name Tinhead Ned is actually a Pratchettian homage to Ned Kelly who wore a homemade suit of armour with a big metal helmet that covered and protected the whole of his head. The real Ned Kelly was hanged in Melbourne Jail. The gallows, and the condemned cell where he spent his last hours, are open to the public as somewhat ghoulish tourist attractions. I’ve sat in Kelly’s condemned cell. You can see the gallows from the cell. The execution area is open plan and highly visible. JANE: How about the ballads? Did Robin get taught these when she was a little girl? ALAN: Yes, the ballads certainly exist. The ballads and poems are based very firmly on the English and Irish folk tradition. They do tend, on occasion, to be somewhat crudely structured – you will sometimes find the word order of sentences awkwardly changed just for the sake of the (often rather obvious) rhyme. But nevertheless there’s an undeniable power about a lot of them. 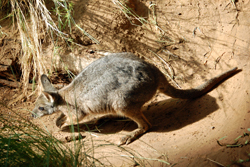 JANE: “Waltzing Matilda” always makes me cry. It’s on a Rod Stewart album I love, but I always skip that one cut. And, you know, I think there’s an allusion to that horse in The Last Continent. Please, go on. Our hearts are out of order. Of course everyone sang out of the side of their mouths with lips and teeth tightly clenched. Robin reports that Princess Anne listened politely but appeared mildly bemused by the whole business. JANE: “Gone with cattle” – that’s so poetic. If I’m translating correctly, this means he’s taken up cattle ranching and his family knows he’s up against a tough battle because of the continually dry weather. ALAN: That’s exactly right. And the concern with drought is a very real fear. The subject obviously meant a lot to Lawson. He wrote two different versions of “Andy’s Gone With Cattle” but both had the central theme of struggling against drought. Too Heads Or Too Many Cooks? Tori commented that even artists need that second pair of eyes. Paul (who was a reporter for many years) mentioned that the only times he could edit himself were when he had a long cooling off period. Jim – who has been spending this past week editing a segment of a report written by someone else and is collaborating on a paper with another archeologist – also commented how much he values that extra point of view on his work. So clearly the editorial cycle is an important element not only in fiction writing, but in non-fiction writing, in the visual arts, and in… Well, that’s my first question, actually! Are there other fields where outside input is a crucial part of the creative process? I’m also very curious about when in the creative cycle feedback is most useful for you. I know that the range varies and that there is no one “right” way. I’m at one end of the spectrum. I don’t want feedback until the piece is done and polished to the best of my ability. For this reason, I don’t belong to any writer’s groups. Jim is accustomed to me talking intensely about a piece in the vaguest manner possible. Part of this is because he’s my first reader and I don’t want to provide too many spoilers, but part of this is because, for me, the piece still belongs to itself, and outside ideas aren’t welcome. I can’t polish until I’m done because, until I’m done, I don’t know where I’m going. I also get to know my characters better on that first part of the journey. That means I can brush stroke them into fuller life in later pass-throughs. Now, if I get interupted somewhere in the composition process, I’ve been known to go and read through what I wrote before I start again. Inevitably, this will lead to some preliminary polishing, but even if I’ve done that, I start with the first line and re-read all the way through as part of my self-edit. Only after I’ve done that do I go looking for that second set of eyes. Jim’s first, but, unless the project is under a tight deadline, I usually ask one or more critically-minded friends to look at the “finished” novel or story. By contrast, I know of writers who anguish over every word, over every character name, over every descriptive detail. They can’t move forward until these parts are perfect. This means their first draft is much, much “cleaner” than mine ever are. Interestingly, many of the writers I know who write this way also belong to writer’s groups, so they recieve input along the way. On a tangent… Always beware of writers who talk about not rewriting. This term can mean very different things to different types of writers. So when do you look for feedback on your story or picture or paper? When is a second set of eyes useful? When do you find that, instead of two heads being better than one, too many cooks spoil the broth? When It’s There… But Isn’t! back. Over time, I’ve worked out a thumbnail sketch of this novel that, to me, gives the sense of the story without the need to go into lots of detail. I feel as if I could verbally recite the entire novel without consulting the text. Well, you can imagine my shock when, not long ago, I had reason to go look at the novel more closely. Other than the first sentence, it didn’t start at all like I remembered. I was stunned. This was my story. It has been read by several people, all of whom have loved it. How could I have been so out of touch with what was actually on the page? The fact is, sometimes writers are the worst people for seeing their own work clearly. Why? 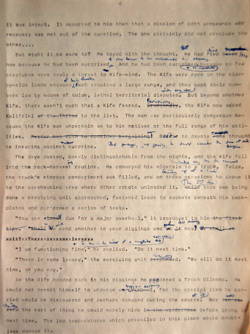 Because the writer not only sees what is on the page, the writer also knows what the writer meant to put on the page. Sometimes it all makes it there. Sometimes it doesn’t. Sometimes it’s there but in the wrong order, and needs to be brought in either earlier or later. I was astonished. I’d finished the story. Why did it need more? When I went back and looked the novel over, I realized John was right. He trusted me to find out what should be in the final chapter. Interestingly, over the years, I’ve had many readers comment to me about details from that last chapter. Clearly, that last bit brought something important to the story. I was sure John was wrong and dove into the manuscript with the passion of a zealot to prove my point. What I realized was that John was right. Details were missing or weren’t as well-emphasized as they should be. I went back and added a bit here and there that made the characters what I had imagined them to be. I’ll take my comment one step further and say that a good editor who has not been working on the project from conception forward is very valuable to a book. I think this is where writers’ groups often fall short. Often, everyone in the group has talked about the book or story in question so often they stop seeing what’s on the page and see instead what they know should be there. I don’t have anything against writers’ groups, but I do think there is a time when a virgin reader is needed. Overexposure is one reason I dislike presenting proposals for a piece. How can the editor judge the actual work if he or she knows what’s supposed to be there before they read the actual work? Interestingly, the times I have caught otherwise good editors out as flat out wrong have been in circumstances where they knew something about the piece in advance of reading it. In these cases, when the editor said something was missing, I was able to show exactly where the “missing” element was, where it was emphasized, and all the rest. The problem was, having seen proposals, having discussed material with me, and – at least I have wondered – having formed a subconscious impression of how it would look – the editor didn’t see what was actually on the page. Now, in the case of the piece I mentioned above, this revision is going to be one of emphasis, not of content. Everything I wrote is still valuable, but I need to change how I present it. And I’m going to do so because part of being a writer is learning how to make what’s on the page mirror what’s in your mind. As I see it, that’s the only way you can share that vision with the reader. If you’re looking for the Wednesday Wandering, just page back for adventures with mermaids and myth. Then come and join me and Alan as we investigate the Australian soul. JANE: I’m still thinking about that fictional Australian character. What can you tell me about Australian culture or folkways or whatever? 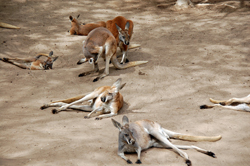 Are Australians really the hard-drinking party animals that automatically come to mind? I know my friend Tori (who studied in Australia for a year) was really impressed that her classmates could party all night and still manage to do well in school. However, students are a special breed the world over. How about the culture in general? ALAN: Yes, they certainly are the hard-drinking party animals you think them to be. But so are the New Zealanders, the British, the Europeans – in fact almost everybody in the world except the Americans, who have a reputation for being rather prudish about this sort of thing. I remember feeling quite horrified at my first American SF convention when I went to a room party and found only soft drinks on offer. Many times at British conventions I’ve gone into breakfast clutching a pint of beer because last night’s party hadn’t finished yet. And I’m not alone in that. JANE: Okay. So that one’s not a stereotype, just cold, hard fact. I remember one convention long ago – Kansas City, I think – where there was a large contingent of New Mexico authors and fans attending. A rallying cry at some large event was “Chile Eaters over here!” At that time I still lived in Virginia and thought this a very odd way to define oneself. Now I understand completely. So, is your Robin more Australian than the Australians now that she lives in New Zealand? ALAN: That’s a hard one to answer. Certainly Robin is very conscious of being an expat Australian and she takes every opportunity to emphasise it. For example, she makes a point of wearing yellow and green, the colours of the Australian national rugby team, whenever it seems (in)appropriate. But so many cultural assumptions are built in when you are born to them that I think it’s almost impossible to turn them off. It’s just something you do, something you take with you whether you are at home or abroad. The thing that typifies Australian culture for me is its wry, dry humour. They have a truly delightfully ironic way of looking at the world. For example, there was an Australian Prime Minister called Harold Holt. On 17th December 1967, he went for a swim in the sea and never came back. Presumably he drowned. As a memorial, they named a swimming pool after him. It’s in Glen Iris, a suburb of Melbourne. You couldn’t invent that if you tried! JANE: That’s gorgeous! I bet his ghost appreciated the gesture. I can’t resist noting that this is a very wet example of dry humor. The other big influence on Australian culture is the way that the sheer size and sterility of the country has affected people’s approach to everyday living. Large scale pragmatism is ingrained in the lifestyle. Remember, Australia is mostly desert. Consequently outback stations are widely scattered. They have to be – productivity is measured in acres per cow rather than the more common cows per acre that the rest of the world uses. You need a lot of acres in order to make a living. JANE: Actually, that sounds a lot like New Mexico. I suspect we have some similar difficulties. How do the Australians handle things like getting the kids to school? ALAN: Many children at the stations have little or no physical contact with the outside world at all. They can’t go to school – the nearest school might be a thousand miles away. And so, since at least the 1920s, Australia has broadcast very high quality educational services across the airwaves. Initially by radio, then television and now the internet. Robin has nieces and nephews in a station way out in the back of beyond, and they go to school via a satellite based high speed broadband connection. And the standard of teaching is very, very high. JANE: That sounds almost science fictional. It’s very similar to how Stephanie Harrington gets her education in Weber’s and my books. But you can’t send medical care over the net. How is that managed? ALAN: Again, since the 1920s, a very efficient flying doctor service has provided primary health care to the scattered outback communities. Since you can’t go to the doctor, the doctor comes to you. Simple, really. JANE: Well, I wouldn’t say “simple,” but certainly admirable. There would be lots of advantages to that model even in a city. No sitting around in a waiting room catching other people’s germs. But how are supplies gotten in? The fuel needed to move heavy goods must make everything very expensive. ALAN: Road trains – huge trucks with several trailers attached – keep the stations supplied. Every six months they drive up, unload the groceries, letters and parcels, then load back up with whatever the station has produced, and take it off to market. JANE: What about water? As you mentioned, Australia is mostly desert. Desert conditions are one reason that most of New Mexico’s population lives in a few urban centers. The folks I know who live “out there” often haul water, but would that work for a sheep station? ALAN: The stations tend to have their own wells. Some of them even have surface water! Robin learned how to sail a yacht on a lake in the middle of the Tanami desert. It’s an intermittent lake – sometimes it’s there and sometimes it isn’t – but nevertheless it’s a lake. JANE: I can see my next question already, but I’m going to save it for next time! The other night, Jim and I watched Hayao Miyazaki’s Ponyo. I’ll admit, when I picked up the DVD, it almost went back unwatched when I read: “Inspired by the Classic Hans Christian Andersen Story ‘The Little Mermaid.’” I have nothing against “The Little Mermaid,” but those of you who know Miyazaki’s work know that he’s not above telling some pretty sad stories. 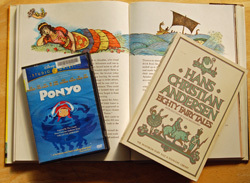 For those of you who are only familiar with the Disney adaptation of “The Little Mermaid,” I’ll note that the original Hans Christian Andersen story is anything but a happy tale. No. I’m not going to slam the Disney version. I enjoyed it and think the softening of Andersen’s tale was appropriate given Disney’s target audience. Nor am I going to provide spoilers for Ponyo beyond what is absolutely unavoidable. Instead, I want to tell you about a really cool insight I had when I was explaining to Jim why Hans Christian Andersen’s original story is not the usual “happily ever after” fairytale. The little mermaid – she’s the youngest of six, by the way – is obsessed with the upper world. In a sense, even before she meets her prince, she’s in love with the idea of him, because of a statue of a human youth she has in her garden. When the little mermaid rescues the prince from a shipwreck, her obsession grows to the point that she can’t stop thinking about him. Even when the little mermaid is told that as a mermaid she’ll live 300 years, she’s willing to trade everything for her prince. Incidentally, she’s also told that the love of a human will give her a soul, but although this has some appeal, it’s the prince she wants. The little mermaid goes to the sea witch and trades her voice for legs, even though she’s warned that every step she takes will feel like knives are cutting into her. Moreover, the sea witch warns the little mermaid that if the prince weds another, the little mermaid will die and vanish into sea foam. Despite ample warnings, the little mermaid makes the bargain. She finds her way to the prince. He, however, is already in love – and like her what he loves is an idea. In his case, he’s in love with the girl he believes saved him from the shipwreck, a girl who is consecrated to a temple. He keeps the former mermaid by him mostly because she reminds him of this other girl. The ending is tragic. The prince is betrothed. When he meets his betrothed, he discovers that she’s the girl from the temple. Apparently, she’d only been signed on for a limited period of service. Of course, the prince is delighted to have his dream come true. He marries her happily… And the little mermaid, having given up everything to live for a brief time in continual pain, vanishes into foam. There’s more to the story, but I’ll get back to that in a second. What hit me as I was telling Jim this version of the story was the realization that I was pretty sure I knew what story Andersen had been adapting for his tale – the story of Ariadne of Crete and her tragic love for Theseus of Athens. Like the little mermaid, Ariadne gives up everything for Theseus. She tells him how to solve the Labyrinth (thus saving his life) and helps him to escape Crete. She is willing to go with him into an alien land (giving up her royal title and “voice”). There’s even a sea link, since Crete is an island kingdom, so symbolically Ariadne belongs to the water. On the isle of Naxos, Theseus abandons Ariadne. There are various versions why he does this. In some versions, he simply forgets. In others, he has a dream that he should leave her. What is important is the core of the story – a woman gives up everything for a man who cannot recognize how much she loves him. The story of Ariadne has other successors than just Andersen’s “The Little Mermaid.” One of these is that of Siegfried and Brunhilde. 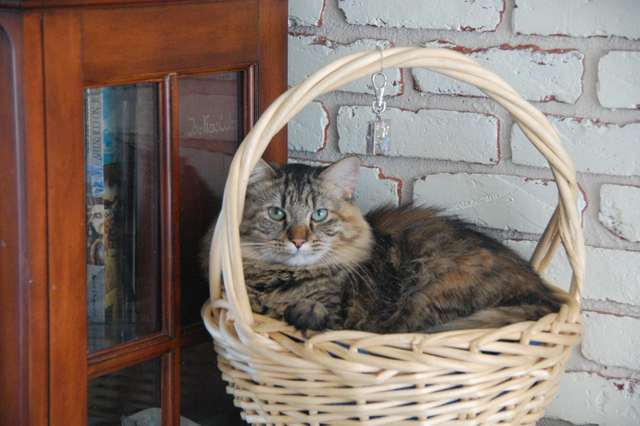 Those of you who’ve seen Ponyo may recall that “Brunhilde” is Ponyo’s original name. Clearly Miyazaki was very aware of this theme of rejection of the lover by the beloved. At the end of both the story of Ariadne and that of the Little Mermaid, the faithful girl gets a consolation prize. In some versions of Ariadne’s tale, the god Dionysos claims her as his bride. And the little mermaid? She gets a promotion in the spiritual hierarchy. From a soulless mermaid, she becomes one of the a “daughters of the air” – creatures which themselves are soulless, but have a chance to win a soul for themselves (whereas mermaids can only gain a soul if a mortal loves them). I promised no spoilers for Ponyo, but I will say that while Miyazaki is clearly aware of all these traditions, he gives the story his own twist. It’s one I liked very much, especially since, the more I thought about it, the more depth I found in the waters in which little Ponyo swims.